It is Science Week in Ireland this week and to mark the occasion I thought I would share out top five science and nature picks from Netflix. We are loving this documentary series covering the life, habitat and customs of a diverse number of tribes and cultures;from the tree dwelling Korowai tribe of Papua New Guinea to the Bajau people of Indonesia who live their entire lives on boats on the water. Anything with Sir David Attenborough is worth watching and this series is yet another gem. There are some wonderful and “never before” scenes covering the night life of the rhinos (who knew that males are known to adorn themselves with antlers to impress the “ladies” down by the local watering hole) and a spectacular fight between two male giraffes. 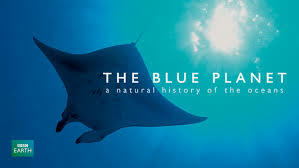 An eye opening documentary with some wonderful under water footage with an honest and startling look at human impact on our oceans. 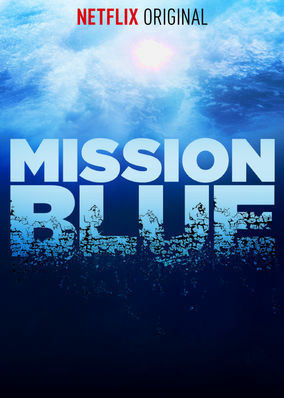 Oceanographer and eco-activist Sylvia Earle’s urgent mission to expose the dire condition of Earth’s oceans is captured in this documentary directed by Fisher Stevens, Academy Award-winning producer of “The Cove,” and Academy Award nominee Bob Nixon. Earle explains that the condition of our oceans, rapidly dying due to pollution, over-fishing, and acidification, is an ecological catastrophe soon to have a devastating impact on all life on Earth. Sylia Earle is an articulate and inspiring woman …. Another documentary featuring Sir David Attenborough, this time looking at mammals, from the well known to the bizzare, including two of my favourites (and previously mentioned here on this blog)… the only two monotremes (egg laying mammals)… the Echidna and the duck billed platypus. This is brand new, just streaming on Netflix since Friday 7th November. We have this bookmarked as our Friday night Netflix treat! Netflix is teaming up with Leonardo DiCaprio to release the documentary Virunga. 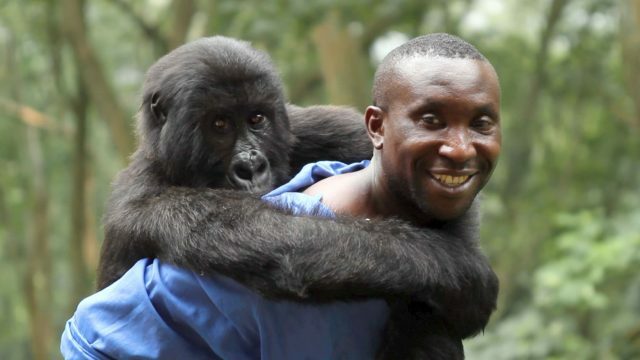 The film from director Orlando von Einsiedel centres on the conflict between park rangers striving to protect endangered gorillas from poachers and industry encroaching on their habitats in Virunga National Park in the Democratic Republic of Congo. The film follows an embattled team of park rangers at Virunga National Park, home to the last of the planet’s 800 mountain gorillas, as they work to fend off encroaching forces of industry, poaching, corruption and war. The award-winning film debuted at the 2014 Tribeca Film Festival, earning a nomination as Best Documentary Feature, and was named Audience Favourite at Hot Docs Film Festival and Best of Fest at AFI Docs, among other awards. So there are just five of our current favourites but there are so many more to choose from, we will be back with more very soon. And of course the best thing is that it doesn’t have to be Science Week to watch them… you can watch these documentaries any time you want!!! Admittedly it was a long journey from Galway, about three and a half hours but thanks to google maps and my flukish wonderful navigation skills, we made it door to door with no errors. The first half of the journey was motorway which is nice for covering ground and the second half was cross country, which is good for the eyes and the soul! Despite the torrential rain as we arrived in Carlow, it already showed lots of potential. Even under such conditions it impressed us with the beautiful scenery, lush green landscape, beautiful deciduous trees splendid in their Autumn robes and the evidence of a previous era of gentry farming in the many high granite walls lining the fields. Another thing that struck me was the number of small public parks dotted throughout the towns and villages. Many with nice signs outlining what wildlife could be seen in the area. This is something that I feel very passionate about; it would be lovely to see a lot more of this around the country. Exactly three and a half hours after we set out, we arrived at our destination…. Mount Wolsley Hotel, Spa and Golf Resort in Tullow. Before we had even checked in the children were asking about WHEN they were going to the swimming pool! Our ‘home’ for the weekend was a three bedroomed, self catering holiday lodge on the grounds of the resort. We are big fans of self catering for family trips but I have to admit we have had our fair share of disappointing properties so I was quite nervous when I turned the key and opened the door. I need not have worried…. I was met with a warm, spacious and beautiful interior. 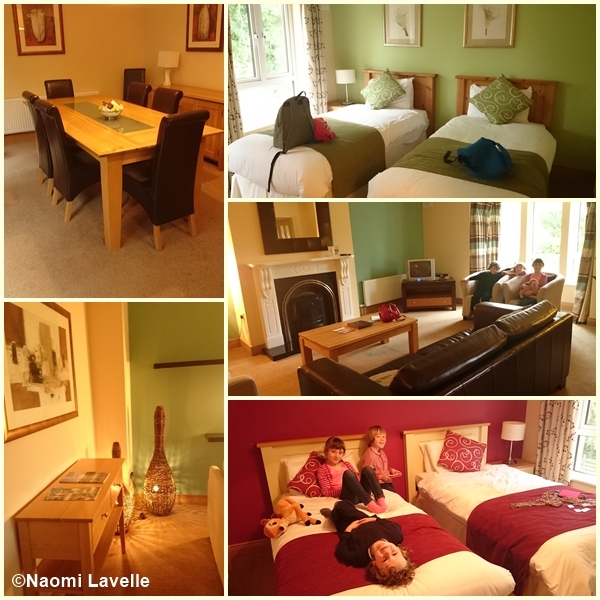 Hands down this is the best self catering accommodation we have ever experienced in Ireland. Once we had settled in we met with Dee Sewell of Green & Vibrant who provided us with all the details of our action packed weekend ahead. Dee had worked carefully with Carlow Tourism, the organisers of the Walk Carlow Festival and provided us with all maps, routes and information … we could tell we were in good hands and that all angles had been covered. All that was left for us was to turn up and enjoy what the Walk Carlow weekend had to offer. All good adventurers need to ensure they are well fuelled so we headed up to the main hotel for dinner. As a parent I was conscious of dining out with children in tow but straight away I was put at ease by the friendly and welcoming staff. We chose to eat early and there were other families doing likewise in the large dinning room. I was impressed with the children’s menu, always a good marker of the quality of the establishment, in my opinion. As well as the usual “nuggets and chips” option there was a wide and varied menu. My children were delighted to see “calamari” as an option on their menu and two of them chose it and liked it. The soup was delicious and home made, there were yoghurt and fruit options and the children’s burger was again of the “home made” variety. Plenty of choice for all the family and after two courses we were almost too full for dessert… but there is always room for ice cream, right? After a good night’s sleep we headed back up to the hotel for breakfast. I just love self catering accommodation when you don’t have to self cater! The breakfast spread was AMAZING! There was everything you could think of…. cereals, fruit, pancakes, pastries, full Irish breakfast and more. I was impressed to see a “free from” section in the breakfast buffet too. 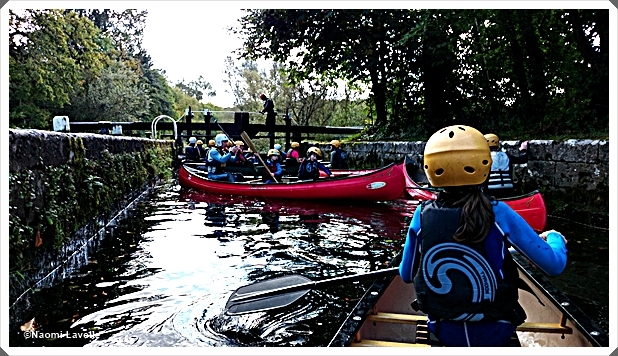 With full tummies and a packed lunch from the hotel we headed off for Borris and for the first stage of our adventure… a canoeing safari along the river Barrow. There were 12 of us in total on the safari with Go with the Flow river adventures. We were a mixed bunch with regard to experience and age from the fairly young (three years old) to the slightly older (there was a very capable and adventurous Granny among us). Kevin, our guide was a very pleasant, chatty man who put us all at easy from the start. There were two to three people per canoe, they were the larger, open Canadian canoes that are very safe and stable… perfect for the complete beginner to the more advanced. 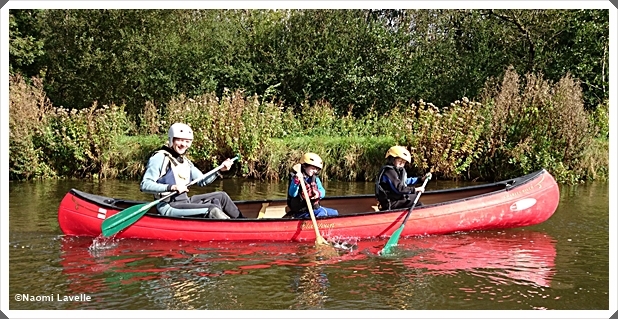 The sun shone bright and warm as we all kitted out in the wetsuits, helmets and buoyancy aids provided, and before we knew it we were travelling up the river. It is one of those adventures where you can just take off and learn on the go, even with children involved (although we may have found ourselves going round in circles a few times). The weather and conditions were ideal for us and the scenery was truly beautiful. There was a comfortable camaraderie established as we all made our way down the river, taking in our surroundings. 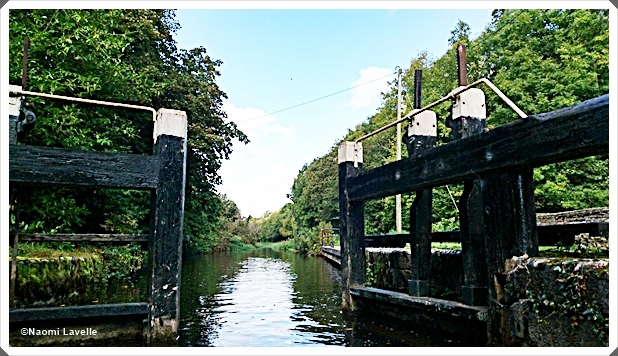 One of the first “obstacles” of the trip was to pass through a lock. It appeared to me that the adults were even more excited about this than the children, many of us exclaiming “I always wanted to do this” and marvelling among ourselves at the efficiency of such an old system. 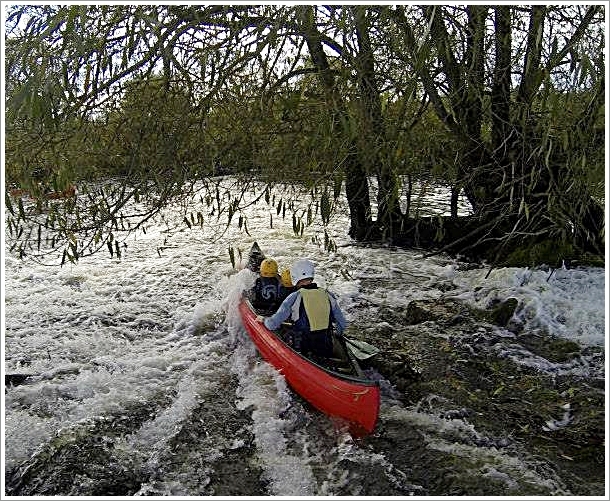 I was a little surprised when Kevin told us we would be going down some weirs and rapids, to add a little adrenaline injection to the whole experience. We got a quick talk on what to do and the reassurance from Kevin that if we capsized he would be straight over to help us… as soon as he had taken a photo of our demise. It certainly added to the excitement for us all and luckily we didn’t give him any opportunities to have a little laugh at our expense. 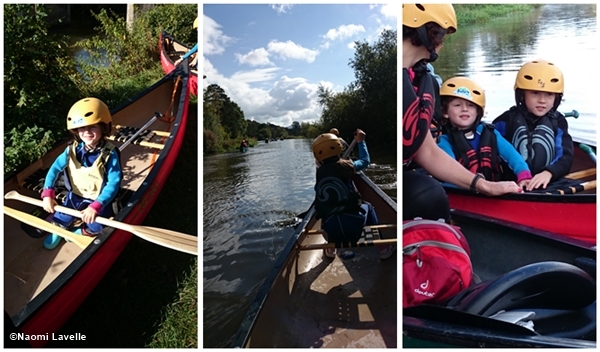 Travelling along the Barrow was a great way to learn more about the county. We got to see and hear about some local flora and fauna but we also got a sense of the local history. Kevin told us a very engaging story of a local legend that earned his name of The incredible Arthur Mc Murrough Kavanagh who, despite having no arms and legs, travelled most of the known world. The whole experience was amazing for every one of us. It is lovely when you hit on something that keeps the whole family entertained and even better when it is outdoors and among nature. Our last canoeing trip as a family was along the Dordogne in France, but much to our amazement the Barrow topped it and had lots more to offer. We would definitely recommend this as a “must do” adventure. You can check out the various activities offered by Go with the Flow, from family canoeing safaris to youth activities, team building excursions and lots more. They post lots of adventure photos on their Face Book page too. I always think that it is the people that can make or break an activity and that is why I really feel that the staff of Go with the Flow require a special mention. Kevin and Mike were excellent. Mike was the quiet, calm type that kept to the back and helped us out when we got a little left behind. Kevin was the main guide on the day and really had that special quality among people. From the young to the not so young, he kept us all relaxed and smiling. 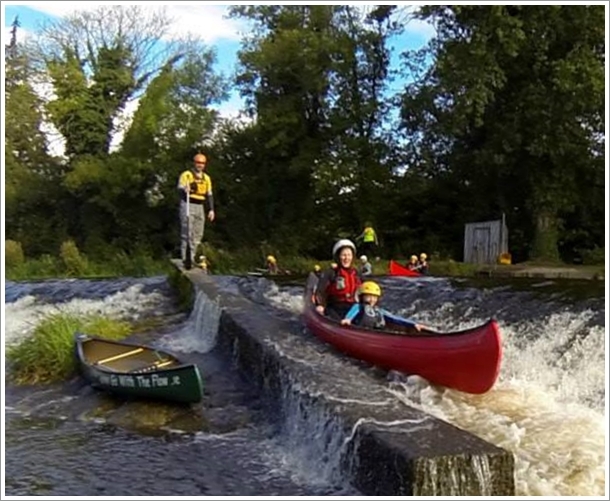 Disclaimer: I was invited on the blog tour of the Carlow Walking Festival by Green and Vibrant. I was provided with accommodation and activities for the purposes of review but received no other compensation for this post. All views expressed are my own, or that of my family. 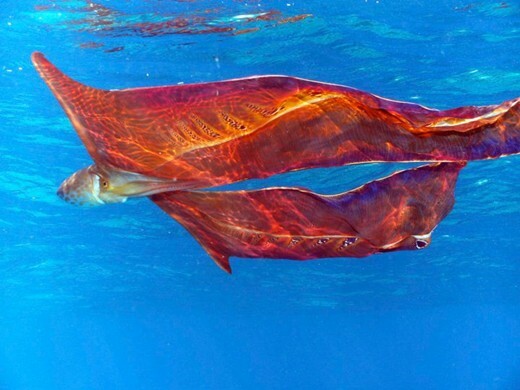 Mystery Creature – can you name it? I have been asked a few times lately if I am going to recommence the Mystery Creature series on the blog…. so here it is. The idea behind this little series is that I post a new Mystery Creature at the start of each week and at the end of the week I will update the post to say what the creature was, along with a little information about it. If you know what the Mystery Creature is then share in the comments below. It is all in the interest of learning and a bit of fun so feel free to ask questions, guess or even do some googling or research to find out the answer yourself. Here is the Mystery Creature for this week… do you know what it is? Update: Want to know what the creature is? Check out the end of week “reveal” to find out. I recently became a member of the Netflix Stream Team and, considering the lack of quality viewing we have available from our current set up, there was great excitement when the apple TV and subscription arrived. We only have one “modern” TV in our house that could take the HDMI cable so we set things up on that one. It was surprisingly easy and painless and within just a few minutes I had registered our account online and we were good to go. I really liked that you could set your personal preferences and get individual profiles for each family member. I was very excited about the wonderful line up of nature programs and documentaries. From Netflix own Mission Blue to The David Attenborough’s Life of Birds – I have so much to choose from. I loved the fact that I could add them to my list in my profile, ready to watch later. So Netflix was installed and we were all set to go, the only thing I didn’t factor in was the rest of my family. The children took to Netflix like ducks to water. The five year old had the tiny remote control sussed within minutes. For the first week he came home from school and, using his most “poor tired me” voice, asked could he have a little Netflix to unwind! I love the way he can watch an episode or two of a cartoon series and then he is happy to turn it off and walk away. 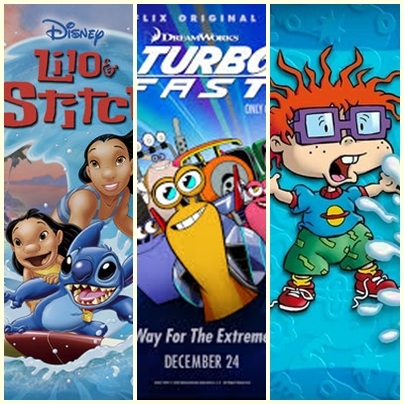 He has discovered Rugrats and Lilo and Stitch, programs that never really made it onto his radar before as his older siblings tended to choose the viewing. There are also Netflix originals such as Turbo for him to enjoy. The five year old… I like having the remote, you can just watch what ever you want. If you turn it off (pause it) and turn it back on and you can watch the things you really like. Some of his favourites are Sonic, Jimmy Neutron and Sponge Bob square pants. Then there was my husband…. when he realised that the last series of breaking bad was at his fingertips he was one very happy man. The only problem I had was that between the children and my husband I wasn’t getting a look in myself. Hubby’s Netflix verdict?… he loves that there are no ads, that he can pause to make a cuppa and that if he turns it off it will resume in the same place for him the next day. Apart from Breaking Bad he has been enjoying some documentaries and was delighted to see Twilight Samurai (a personal favourite)among his viewing options. Eventually I came up with a solution to the problem. I decided to put Netflix on the other (ancient) TV by streaming it through the Wii. I found these instructions on line and, with a fair amount of techno trepidation, I had a go. My fears were unfounded as that worked a treat too. Despite the children claiming “Oh great now we can watch Neflix on one TV while Dad watches his programs on the other!” I have put my foot down and claimed my space on the Netflix viewing couch. With the colder nights settling in and the fire being lit it is nice to have the TV viewing sorted. I loved watching Brave with the children and when they go to bed Hubby and I have checked out a few movies and started into those Nature documentaries I mentioned (but there will be more about them later). Last night we found a very interesting documentary called Life Below Zero – a reality adventure series follows individuals who’ve chosen to live in the remote Alaskan wilderness, miles from civilization. We are looking forward to catching another episode this evening. So what do I like most about Netflix?… I love the fact that it is choice TV viewing on demand, no ads, no endless flicking through channels of nothing interesting. I like the fact we can watch what we want, when we want. I am really looking forward to watching those Science and Nature documentaries and checking out what else is on offer… now that I have got my hands on the remote! Did you guess last week’s Mystery Creature? It was the Thorny Devil (Moloch horridus) or Thorny Dragon. This formidable looking lizard is native to Australia. But it he as dangerous as he looks? Here are some interesting facts about the Thorny Devil. 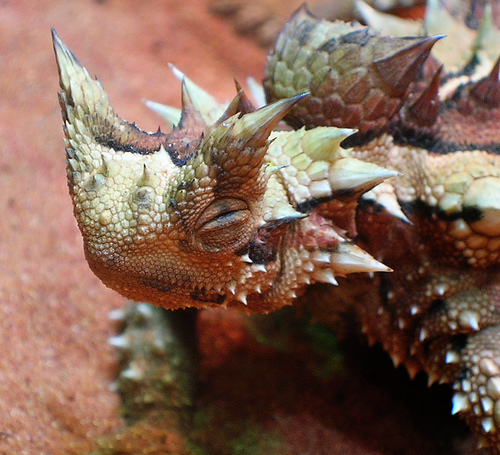 The name Thorny Devil or Thorny Dragon is quite an intimidating monocle but even more so is the scientific name for these lizards… Moloch horridus; Inspired by the poem Paradise Lost (by Milton) in which the god Moloch is described as “a horrid king besmeared with blood of human sacrifice”! As well as ants, the lizard needs water to survive the arid scrub lands and deserts of it’s Central Australian habitat. It has a very interesting way of “harvesting” water. It walks slowly through the scrub letting dew drops fall on it’s thorny body. Between the thorns are tiny channels that carry the water right to the Thorny Devil’s mouth. Another interesting feature of this animal is it’s defense mechanisms. Although in reality it does not have any real weaponry of defense it’s thorny exterior acts as a deterrent to potential predators (mainly wild birds). If this is not enough he bends his head, revealing a false head with big horns above his neck. 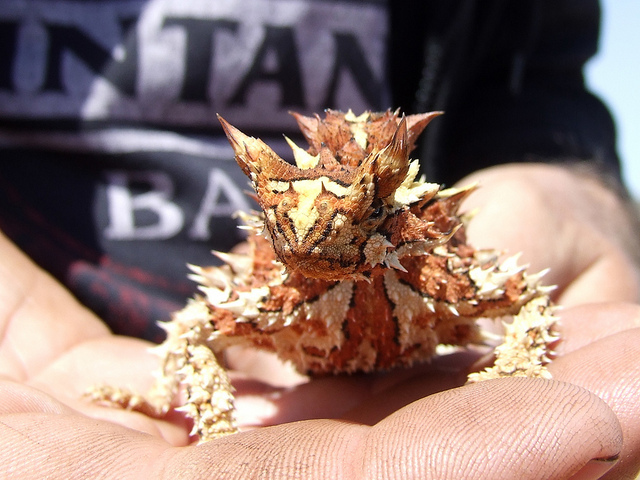 So although the entire surface of the Thorny Devil is covered in spiky scales these are to defend rather than to harm! I don’t really think he deserves the name, but it might just add to his street cred and keep the predators at bay! What do you think… cute or ugly, or just misunderstood? This week’s mystery creature… robin eggs! It was a Robin! These six beautiful speckled eggs were laid by a robin right outside my kitchen window. 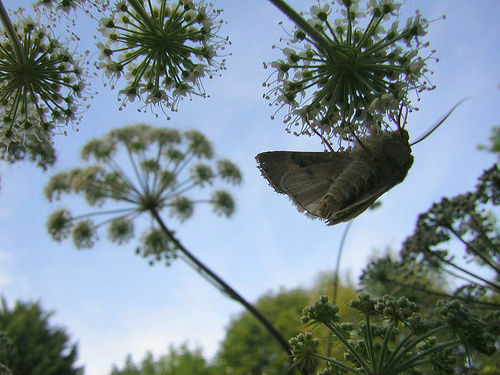 I have been charmed watching her gather the nest materials and then “sitting casually” on the fennel plant to distract any threatening on watchers of her ultimate path to her new home. She prepared her nest on the ground alongside my herb garden, in a clump of scutch grass. As we do not wish to disturb this nest in any way the possibility of grass cutting or weeding in that area of the garden has been put on hold…. can you hear my husband’s sigh of relief? The female does all the nest building and then lays four to six eggs (one a day); the male helps out by helping to feed his mate during these busy times. The incubation period is approximately 13 days and, judging by the haggard look of the birds over the last few days, I would say their little brood have hatched….. I remember that stage in my own life! Thought of the day… "the passing of the seasons"
Well it is official… Spring is here for sure… the Cuckoo was heard from our garden yesterday, not by me I’m afraid, not yet anyway, but it definitely marks the ticking of nature’s clock, the passing of the seasons. The cuckoo is calling, tick that box, all is well with the world! I have to admit I love the anticipation of each seasonal landmark. The first snowdrop, the arrival of the golden daffodils, the synchronous timing of the budding of each tree, like a perfectly tuned orchestra, each player patiently awaiting it’s moment and joining the symphony at exactly the correct point in time. My children have lived in this house all their young lives and I am charmed to see them remarking on these natural milestones too. They begin to remember their own landmarks of the passing of the seasons and ask me when a certain one will arrive. These things they have learned on their own… or more precisely, Mother Nature has taught them, tapping them gently on the shoulder to anchor the arrival of each new marvel. We are lucky to live in the country where nature so beautifully illustrates the passage of the seasons. The hedgerow by our house, each plant revealing another milestone. A natural metronome tapping out the appearance of each… the colts foot, lesser celandine, cowslips, dandelions, herb roberts, speed-well, the flowering gorse, bird’s foot trefoil, angelica, meadow sweet, valerian. As one disappears another arrives and there is a feeling of familiarity and contentment in seeing an old friend emerging once again. Each a lovely reminder of our early years in this house, before we had children, when my husband and I would walk the lane together and he would point out the arrival of each new plant, teaching me it’s name. Now every time I see a familiar arrival I remember that special time.